"You have a minute to help that baby breathe," says Dr. Mark Hathaway. He works as a senior adviser for family planning at USAID&apos;s Maternal and Child Survival Program, and he&apos;s showing me how to get a newborn to take its first breath. And it has to happen now — during the "golden minute" after a baby is born. That&apos;s what the medical world calls the tiny window of time an infant must bring oxygen into its lungs. But I&apos;m not a doctor or a nurse. I&apos;m a reporter. So I am pretty clueless. 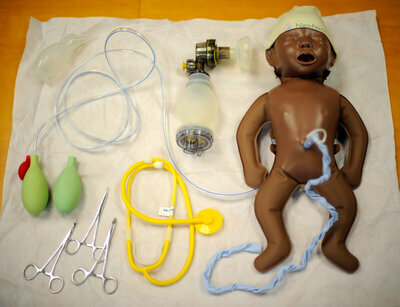 I lift up the "baby," a mannequin called the NeoNatalie. Filled with water and covered with soft plastic, it&apos;s heavier than I expected — about five or six pounds, just like a real newborn. A wave of panic washes over me. I do what I remember seeing on TV shows. I lift the baby by its feet and slap its backside. "Yeah, don&apos;t do that," says Hathaway. I have a lot of company in the club of clueless birth attendants. In the developing world, there&apos;s a dire shortage of health care workers and nearly half of all births take place without a skilled birth attendant. A nonprofit called Seed Global Health is determined to change things. In 2012, Seed teamed up with the Peace Corps to create the Global Health Service Partnership, a volunteer program that sends U.S. doctors and nurses to Africa to train medical professionals in a variety of techniques, including how to resuscitate a newborn who&apos;s not breathing. Seed Global Health has so far introduced the program in Malawi, Tanzania, Uganda, and most recently, Swaziland. In the past two years, 73 American volunteers have trained more than 7,200 African faculty, residents and students. After my failed attempts to help my mannequin breathe, Hathaway shows me the proper procedures. He turns the doll to one side and begins vigorously drying its back and head with a towel to help the baby warm up. "Sometimes that&apos;s all that&apos;s needed," says Hathaway. If that doesn&apos;t do the trick, he has all the tools ready for plans B and C: a suction tool and a bag mask. The suction tool, which looks like a turkey baster, clears out a baby&apos;s nasal passages by removing mucus and gunk from its nose. Using it once is usually enough to help a baby breathe. If 20 seconds go by and the baby still isn&apos;t breathing, Hathaway would turn to the bag mask, which pumps oxygen from the air into the baby&apos;s lung passages. Aliasgar Khaki, a 24-year-old fifth-year medical student from Dar Es Salaam, Tanzania, is one of the trainees. He was taught by Dr. Esther Johnston, a former Seed Global Health volunteer who is now the director of family medicine for the nonprofit. In Khaki&apos;s country, roughly a quarter of newborn deaths are caused by birth asphyxia — a lack of oxygen to the lungs. But the university he attends didn&apos;t have the resources to teach its students the proper techniques. "They had a program, but the problem was that the equipment wasn&apos;t there," says Johnston. "It&apos;s hard to teach neonatal resuscitation without a mannequin. You can teach the principles, but if you don&apos;t practice it, it doesn&apos;t get into your muscle memory." Inspired, Khaki started organizing trainings for other students, nurses and interns in the area, demonstrating with donated NeoNatalie dolls from global health groups likeJhpiego. The NeoNatalie set costs about $70 for nonprofits. Dr. Vanessa Kerry, co-founder of Seed Global Health, hopes the trainees will now show others what they&apos;ve learned. "If we focused on teaching new doctors and nurses how to be great educators with the idea that one doctor could go on and teach ten, who could go on to teach ten more, and so on, we could have this great force multiplying effect," she says. For Hathaway, the future of Seed Global Health&apos;s training program will ultimately rely on the power of the individual. "What moves things forward is a champion," he says. "If you have someone in a health facility who really wants the infant mortality reduction to happen, that person will work hard to keep following through on things." Since Khaki&apos;s training with Seed Global Health, he&apos;s had a chance to practice his neonatal resuscitation skills in real life. A week after his first training with Johnson, he visited a hospital with a relative. In the nursery ward, he saw a "code blue" situation: a baby struggling to breathe. How did it make him feel?The nurse on duty didn&apos;t know what to do. Khaki quickly stepped in and saved the baby&apos;s life, using the step-by-step techniques he learned from his training (which is what Hathaway showed me in my mini-lesson). "Every cartoon character has their own superhero outfit," he says. "Mine was my white lab coat."